This photo is from "L’art...En Eaux Troubles" (Art...in Troubled Waters), an exhibition of contemporary art in Paris. I found this photo via TreeHugger and thought this is fitting for this week's theme. This photo tells us a thousand stories! Others may see this as another brilliant creative idea...a new found way of recycling bottled water. Some may just look at this as something about shaping a culture. Well, I'd day it's more than that. The heartbreaking ingenuity of this person is an economic call not just to political leaders but to all of us. You may have your own story for this photo...just as I could go on and type more...yet all I can think of for now is, I wish this person has real shoes! This week is another challenge for me...and I am so excited to see what others have. Let's visit PhotoHunt's HQ to check more plastic! Everything you say is quite true... yet I can't help but be impressed by the ingenuity that thought to create this in the first place... Yes, it's sad, but it's always interesting to see the coping mechanisms humans come up with to deal with specific situations. You know what I mean? Very interesting & true. Great photo choice for this week's PH theme too. Designer footwear indeed. The whole concept is sad, but still such ingenuity, huh? Love this entry. Fabulous photo-- and an even better reminder of how far humankind has yet to go to take care of our global community. Always makes me wonder how many "Einsteins" have had to spend their lives meeting the basic need of survival instead of being given the opportunity to create, discover, or invent a better future for all of us. We need to ensure that every person's basic needs are being met, so that we can benefit from the talents of all. with footwear like that who needs anything else. A wonderful piece of art with a contemporary theme. love it. Sorry I referenced the wrong web site of my post. If you like beautiful jewelry visit the aforementioned site of a friend. so so true. I find the picture quite sad and a grim reminder that there is so much to address in this world right now. What a thought provoking post and a moving picture. Great choice for the theme this week. wow--makes my plastic look a little trivial. wonderful photo. Hope you can stop by to view my photo hunt Thanks so much. A comment on our times. 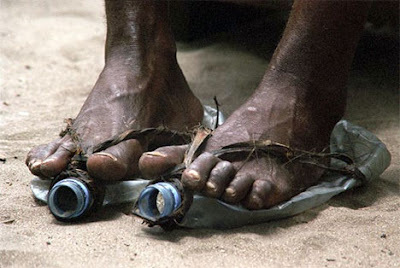 In Tanzania, I saw people wearing sandals made out of used tyres. Thing is -- they actually looked quite comfortable and ingenious! BTW, do you have any photos of your own to share? Creative use of found materials!